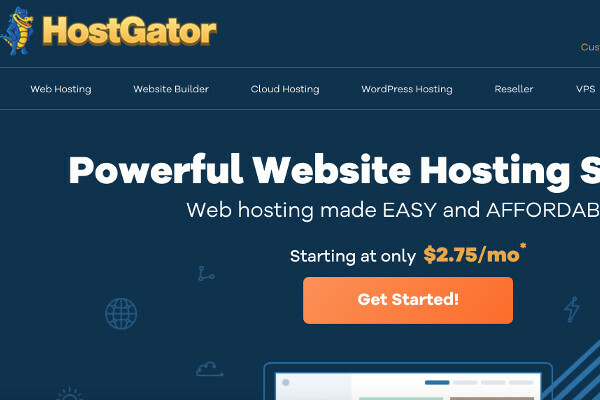 Have you been looking to HostGator as your next hosting provider? In this article we cover all the hosting plans HostGator has to offer. We provide insights as to how they became a hosting giant by exploring some pros and cons, their client services and their plans and features. Our final verdict highlights their strongest plans and here we also advise you which plans are best, depending on your site needs. Let's get to it with a few pros and cons. Pick up a serious bargain with Hostgator. HostGator is an exceptional hosting choice if you are looking into Cloud WordPress hosting or VPS hosting. These plans are very powerful and will allow your site to handle traffic well into the thousands per day, whilst their features offer great functionality. Below we take a closer look at a few pros and cons related to HostGator. What are the Pros & Cons of HostGator? Great uptime – HostGator guarantees no more than 8 hours of downtime per year; that’s a 99.9% uptime guarantee. Free site transfers and one-click installs – HostGator simplifies transferring your website by requiring you to only sign up and they will do the rest. Their simple one-click website installer will have you up and live in no time too. Unlimited features – HostGator offer an array of unlimited and unmetered features. You can expect unlimited disk space, unmetered bandwidth and unlimited databases. Price – Hostgator offers the most consistently low priced hosting plans on the market. Their renewal pricing is also much lower than competitors making for a great long-term choice. Green initiatives – HostGator like a few of its competitors, is a company that runs on renewable energy. Renewable energy units are purchased to offset the units used from the power grid. By equating purchased units with used grid units, companies become carbon neutral. Average speed – Hostgator provides very mediocre speed especially in their shared hosting plans. TTFB(Time to first byte) can at times be way below the industry average which has several negatives for your website. These negatives include user experience, ranking and many more. Upsells – In recent years, HostGator has become partners with several companies providing website plugins. These plugins are promoted to you throughout your signup process, some are useful and others are not. The three that are most commonly displayed are SiteLock, CodeGuard and MOJO Themes. Domain price – HostGator have a pretty steep domain price when compared to competitors. To avoid this, simply register your domain name with one of the cheaper web hosts. Hereafter, direct your DNS via cPanel to HostGator. What hosting plans and features does HostGator offer? HostGator offers a wide variety of hosting plans to suit everyone's needs. The list of plans include shared hosting, WordPress hosting, VPS, cloud hosting, dedicated server hosting and more. Shared hosting- Shared hosting is a great option for those starting out. The shared hosting plans are priced to favor beginners and these plans largely serve static websites. It is a good thing to remember that if you start out on a shared hosting plan, you can easily scale to a more powerful plan as your online expertise increases. Cloud hosting – Cloud hosting provides a more stable, faster and better performing service than shared hosting. This plan is more stable because resources are shared over several servers, so unlike traditional plans where your website is linked to only one server, if a server is down, you are automatically rerouted to another one which is live. HostGator also offer Cloud hosting optimized for WordPress which allows for a much higher performing WordPress experience. VPS hosting – VPS hosting is a big upgrade in performance. With a definite amount of server resources at your disposal and root access to customize your environment, you’ll be able to optimize performance. This means you will be able to set up your VPS plan so that it is optimized for your site needs. Dedicated hosting – HostGator has several dedicated hosting plans on offer. Dedicated hosting is the most powerful hosting service of them all. Renting your own server means you have complete access to all its resources and you can set it up any way you need to. Dedicated plans are able to handle advanced applications and handle the most amount of traffic, so this is for those high volume websites. Reseller hosting – Reseller hosting is available if you would like to start a hosting company, but prefer to be an intermediary which connects users to hosting plans. HostGator offers Reseller plans so that you can do just that. What is HostGator's Customer Service like? HostGator like many of their competitors offer phone, email (ticketing system), community forums and live chat as customer support channels. Their client support system is simplified through their support portal. This portal connects you to support staff, allows access to their helpful community threads or their video tutorials that cover many common website issues. You can expect support lines to be available 24/7/365 which means no matter when your issues arise, their support team will be right there to assist you. If reliability and value packed plans is what you’re looking for, then HostGator is for you. Their pricing is consistently great especially when it comes to renewals and therefore as a long-term host, they’re a great choice. Cloud and VPS hosting are without a doubt HostGators best plans.The functionality, reliability and added features lie right up there with the best on the market. If shared hosting is however what you’re after, then we feel you will find more value with competitors such as InMotion Hosting or BlueHost. Devon is our resident online business and social media guru. With a background in digital marketing, Devon has worked in a consulting capacity helping small business scale their reach and engagement online. When not consulting or writing about online business, Devon can be found surfing in his hometown, Cape Town, South Africa.